This lentil recipe with spinach and garlic tastes as good as it looks! These are top super foods in a delicious combination. Lentils are the most delicate of all the legumes and cook quickly. In America lentils are usually made into a soup with a ham hock but this is terribly limiting. Not that lentil soup with a ham hock isn't great - it is. But there are so many other ways to cook lentils. Lentils are probably the most versatile of all the beans and arguably the tastiest. Lentils and all legumes are low glycemic. There are lots of health benefits to eating legumes because they are so high in fiber and full of vitamins and minerals. Beans help to lower cholesterol, control your blood sugar and promote good heart health. Garlic is an excellent source of minerals and vitamins and also acts as an anti-viral and anti-bacterial agent. Spinach is great for your nervous and digestive systems and helps you to detox. Dark leafy greens contain lots of antioxidants. One cup of lentils provides 17 grams of protein and no saturated fat. Beans (except for soybeans) are not a complete protein, so if you are not serving meat you need a whole grain like low glycemic barley or quinoa consumed at the same meal to be a complete protein. Wash lentils thoroughly in colander. There are many varieties available these days, French green, red, brown, all are good. Turn them into 3 quart pot and cover with water, about 5 cups. Add the salt and bring to a boil, simmer uncovered only 15 minutes or to taste. Do not overcook! Lentils have a wonderful flavor but they are mushy and bland if they are cooked too long. Drain the lentils. Add the rest of the ingredients, sprinkling the parmesan on top and keep covered for 10 minutes until the spinach and garlic are soft and all the flavors have had a chance to mix. Makes about 4 cups of lentils. You can serve 2 people and keep half for another meal or to add to soup. This recipe can stand alone with a salad or vegetables and a grain or it can accompany fish, chicken or beef for a heavier meal. Legumes and a whole grain eaten together includes all the essential amino acids for a complete protein. Lentils go really well with steak or fish or with sprouted grain tacos. Lentils are easily the most digestible beans there are and they have such a delicate flavor that they are my personal favorite. For more information on legumes please go to how to cook beans. 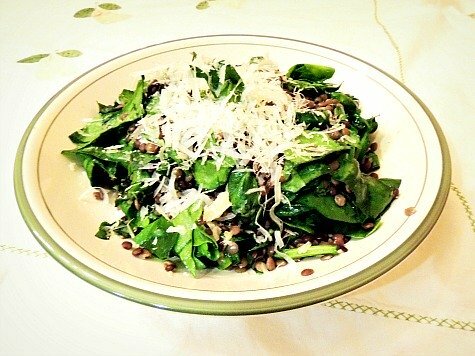 Return from Lentil Recipe with Spinach and Garlic to Low Glycemic Recipes. Return from Lentil Recipe to Lifetime Fat Loss home page.